I reviewed the stages of development and reviewed the significance of surrender – of hitting bottom, of powerlessness. 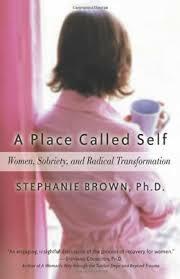 Then I addressed the question, “How can women accept their powerlessness when the culture is pushing them to claim their power?” Throughout the ’80s and ’90s, I found that a very thorny issue for women in recovery. I believe that’s where the paradox comes in: that women, just like men, come to understand their fundamental humanity in the powerlessness, in the realization that we are all ultimately dependent – we find the power in powerlessness. We are not self-sufficient. We cannot go it alone. The dependence is the very beginning of that discovery and comes in reaching out, acknowledging our powerlessness, and coming to believe in and connect with something greater than ourselves. The initial dependency is the transfer of dependence from the drug to people within AA or other recovery support meetings, which then expands as the individual grows developmentally. That attachment becomes a belief in a Higher Power, which each individual defines. You externalize your dependence – you place it outside yourself in the books, meetings, or people of AA and recovery. Paradoxically, you will come to believe in a power greater than yourself, which you define, and in accepting your powerlessness, you experience a new kind of power. The second paradox I defined was the wholeness of a divided self: accepting internal conflict. This is really vital to understanding the integration of mental health models with addiction and a 12-Step recovery developmental process. Some mental health theories, particularly psychodynamic, psychoanalytic, and developmental perspectives, see conflict as part of the human condition, which is also a theme in religion and philosophy. But some people in mental health treatments and some who are new to recovery stand by the notion that you shouldn’t experience conflict – that conflict means you’re not doing something right. This has been difficult for me through all the years of my own recovery: to hear people suggest that if you’re not feeling good in recovery, you must be doing something wrong. This view is detrimental to people who come face to face with all kinds of emotion, pain, and conflict as a result of recovery. This pain is progress. At times, you’re going to feel worse as you open up to feelings and memories and make sense of your life. You’re likely to experience inner conflict as you work the steps. Conflict is part of human nature and of being human. So, the paradox of the “wholeness of a divided self” is in accepting conflicting parts of ourselves – even a war inside – as “normal” and ongoing as part of a healthy life. Many people stay active in 12-Step life because it is so rich in opening up the paradoxes and the conflicts that we all experience but usually try to deny or think we should deny or fix. The third paradox is independence built on dependence – becoming separate through connection. Most people believe you shouldn’t be dependent- especially in American culture – that dependency is such a bad thing. It means you’re weak. But dependency is part of being human. We are all dependent. We can’t go it alone. There is healthy dependence and unhealthy dependence. Addiction is an unhealthy dependence, but in recovery, people grow into healthy dependencies by becoming attached to AA and the people in AA. You have a new experience of growing up. First, you are dependent. Then you grow into separation and independence and autonomy as a result of having had a healthy dependence. Nobody gets to independence without that experience of healthy dependence. The 12 Steps are all about acknowledging dependence and growing into a healthy relationship with it. The final paradox is standing alone with the help of others, which is connected to the last one but is more specific. We are all alone in essence – come in and go out absolutely alone. We can accept that state of total aloneness by virtue of the attachments we form and by standing alone with the help of others, which is the healthy dependency that is the essence of the AA model. AA is an apprentice model of learning. Psychotherapy is hierarchical. The therapist is a professional authority with specialized expertise. In the AA model, the person from whom you seek guidance is an authority through personal experience and what that individual learned from others who had also experienced addiction and recovery. Knowledge is passed on from one person to another. Each person has had the experience of being in the dependent position and then almost immediately becomes one who passes it on.